I’ve been concrete pumping driveways, foundation work, footing, sidewalks, curbs and gutters, block wall, jobs that are 25 feet away to jobs that are 400 feet away for the past 10 years here in San Luis Obispo CA. Believe it or not, but I take a lot of pride in my pumping and I actually love doing it! I show up to jobs fast, I set up my pump fast, and have it primed and ready to go before the mixers arrive for concrete contractors. 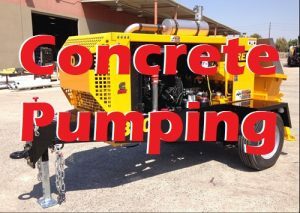 So… whatever type of job you got going on and need a concrete pump, I’d be totally pumped to put my pump to work for you. I am a great concrete pump for hire and I’d love the opportunity to show you why. Or, say you’re just browsing around Googling right now “concrete pump for hire In San Luis Obispo ” and it’s the middle of the night, you can just shoot me an email. Use the form to the right of this page or if you’re doing it on your smartphone, it should be here on the bottom. Don’t you worry, I answer my emails.